Informant America: Points to Ponder While waiting for the Parole Board Decision on parole for Rick Wershe, Jr. Points to Ponder While waiting for the Parole Board Decision on parole for Rick Wershe, Jr. The injustice of the imprisonment of Richard Wershe, Jr.—White Boy Rick—is slowly but steadily gaining public attention through various media stories. Wershe is awaiting word on whether the Michigan Parole Board will consider him for parole soon. He's in the 29th year of a life prison term for a non-violent drug conviction. This post is a redacted and updated reprint of a previous piece on July 12, 2015. Rick Wershe, Jr. still needs your help in his battle for justice. His prospects are looking good but he's been disappointed before. He needs his growing public support to continue. It's time for Michigan politicians to get involved in Rick Wershe's case. The story of Richard Wershe Jr.’s life sentence for being a teenaged, non-violent drug dealer (that’s what he was) is as much about the politics of crime as it is about crime. Reading this, keep the notion of politics and “We, the people” in mind. Wikipedia says politics is from the Greek word politikos. That is, of, for or relating to citizens. Rick Wershe helped the FBI put corrupt Detroit cops in prison and put the spotlight on some who should be behind bars. A strong case can be made that Rick Wershe is still in prison because of a Detroit political vendetta. There are some in Detroit who want to keep him in prison until he dies. At the time Rick Wershe was convicted—1988—Michigan had a law mandating a life sentence for anyone convicted in a case involving over 650 grams of cocaine. That's about a pound and a half. Rick’s prosecution involved eight pounds of cocaine. His trial judge, Thomas Jackson, had no choice once the jury reached its guilty verdict. Rick Wershe was sentenced to mandatory life. All inmates convicted under that harsh law who were NOT involved in a violent crime, and who were juveniles when they were convicted, have been released from prison; all except one: Richard Wershe, Jr. If, as the evidence suggests, Rick Wershe is in prison for political vendetta reasons the people of Michigan should ask and keep asking some hard questions about wasting tax dollars to satisfy a vendetta by some Detroit criminal “justice” advocates. It’s costing Michigan taxpayers about $44,000 per year to keep Rick Wershe, Jr. in prison for helping the FBI prosecute corruption in Detroit. He’s been behind bars since 1988. That means the taxpayers have paid about one million dollars—give or take a hundred-thousand bucks here or there—to punish Wershe under the totally false premise that he was—and remains—a menace to society. Some months ago I filed a request under the Michigan Freedom of Information Act for Rick Wershe’s “disciplinary” file from the Oaks Correctional Facility where he is serving his life sentence. My request was officially denied…because... no such file exists. A prison official told me Rick Wershe is as close to a “model” prisoner as there is. There is no question violent criminals, especially repeat offenders, need to be in prison for very long sentences and in some cases, life. But Rick Wershe was never involved in violent crime. He never ordered anyone killed. He never hurt anyone. Yet, he remains in prison while over the years multiple-murder killers -hitmen - have been set free by the Michigan Parole Board. 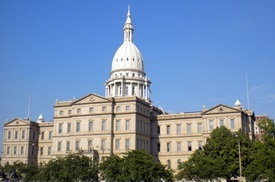 An interesting thing has happened in Michigan politics in recent times. People who once loudly proclaimed their devotion to law-and-order are beginning to wonder if a broad-brush, lock-‘em-up-and-throw-away-the-key policy is such a good idea. It’s not that they’ve been hit with a compassion stick all of a sudden. It’s about money—the waste of tax money. That kind of tough-on-crime posturing comes with a hefty price tag. No less a conservative than Newt Gingrich says it is money wasted. Gingrich has been preaching prison reform from California to Georgia, from Alabama to Michigan, Gingrich has been penning op-ed articles in local papers arguing the time has come to quit wasting tax dollars incarcerating non-violent criminals. “Are taxpayers getting their money's worth from the program? “The state's correctional system churns through $2 billion (emphasis added) each year, and now consumes $1 out of every $5 of the general fund. And because of broad parole board discretion and complicated sentencing guidelines, people incarcerated in Michigan serve longer prison terms, on average, than any other state in the nation. The way to quit wasting tax money on Rick Wershe is to set him free. His case needs to be front and center in the ongoing political discussion on prison spending. Rest assured it will be one of the campaign issues in the 2018 gubernatorial campaign. Current Michigan Attorney General Bill Schuette, a Tea Party darling who loathes taxes but has spent most of his adult life living off taxpayer money, is itching to become governor. And he has fought Rick Wershe in federal court in behalf of the Michigan prison system. If Schuette gets elected it seems likely he will try to make a national name for himself being being the nastiest, cruelest, let-anyone-not-in-the-Tea-Party-die politician in the country. Richard Wershe, Jr. was never involved in violent crime. Richard Wershe, Jr. never had a drug gang. Richard Wershe, Jr. never operated crack houses. Richard Wershe, Jr. was never indicted or charged federally or locally with conspiracy, the crime related to drug trafficking organizations. Richard Wershe, Jr. was never named as an unindicted co-conspirator in any Detroit federal drug case. His name never even came up in the Curry Brothers case, the Chambers Brothers case, the Best Friends case or any other major drug and murder trial in Detroit. Richard Wershe, Jr. was never charged with operating a Continuing Criminal Enterprise, known as the federal “drug kingpin” law. If he was a “kingpin” or “drug lord” why wasn’t he charged as such? Informant America has been reciting these facts about Rick Wershe for two years. Some in the media have just discovered them and try to pretend they are revealing some "news." It’s true that Wershe—also known as White Boy Rick—was notorious in Detroit for a few months in the late 80s. But that was a result of shoddy, disgraceful reporting by the Detroit news media. The smearing of Richard Wershe, Jr. by the Detroit newspapers and television stations in 1987-88 is one of the most shameful episodes in the history of journalism in Detroit. As a former Detroit TV news reporter I don’t say that lightly. It’s a sad fact that reporters who branded him a drug lord and drug kingpin never bothered to ask for the evidence behind these law enforcement lies masquerading as fact. Look at the bullet point above and ask yourself; why didn't any reporter look to find out if the police and prosecutors were telling the truth about Rick Wereshe? You already know the answer. If you believe the Wershe case is a grave injustice in our criminal justice system, and a symptom of larger problems, you need to pay attention next year, an election year, and not just now that Rick Wershe may finally get some delayed justice. Rick Wershe is a symptom of a much bigger disease in Michigan's criminal justice system.